Two more homes have been destroyed by the Cold Springs Fire burning near Nederland. That brings the damage total to five homes and three outbuildings destroyed. More than 460 personnel and 24 aircraft are assigned to the fire. "They're saving homes, and they're working their as--- off to do it," said Boulder County sheriff Joe Pelle. "A ton of good people are working really, really hard to keep your homes safe." Pelle said the fire has burned 606 acres. Nearly 2,000 people have been evacuated. Officials with the Boulder Office of Emergency Management are expecting erratic, gusty winds up to 35 mph on Monday. "Crews will be directly fighting the fire and digging fire line on several fronts Monday, including heavy engine work on Hummer Road, fire line on Hurricane Hill, and direct fire fighting in the Bonanza area," the OEM said. "Additional fire trucks are being staged along Boulder Canyon today in order to quickly battle any spot fires that may start from embers blown by the gusty winds." See pictures of the fire from Airtracker7 on Monday here . A fire relief fund has been set up through Foothills United Way to financially assist those families impacted by blaze. If you want to make a donation, you can visit the Cold Springs Fire Fund website . The funds will be distributed by the Boulder County Department of Housing and Human Services through case managers working with fire-impacted residents to determine need. Two out-of-state campers have been arrested for igniting the fire, the Boulder County Sheriff's Office says. Jimmy Andrew Suggs, 28, and Zackary Ryan Kuykendall, 26, both of Vinemont, Ala., were in court Monday. Suggs bond was set at $150,000 on Monday, Kuykendall's bond was set at $200,000. Read the arrest report here. They were arrested on suspicion of fourth-degree arson, a class four felony. The men face a felony arson charge because lives were endangered as a result of the fire. The blaze started at an ad hoc campsite near the Peak to Peak Highway and Cold Springs Road. The two men, along with a woman, were camping on private property and had established a campfire overnight Thursday into Friday morning. "The men did not ensure that the fire was properly extinguished by dousing it with water, or making sure the ashes were cool to the touch before leaving the site," an official with the Boulder County Sheriff's Office said. Officials believe the winds in the area, combined with the weather, allowed the fire to continue smoldering. Elizabeth Burdeshaw, 20, a mutual friend, will not face charges, as she did not have any involvement in creating, maintaining, or extinguishing the campfire, officials said. 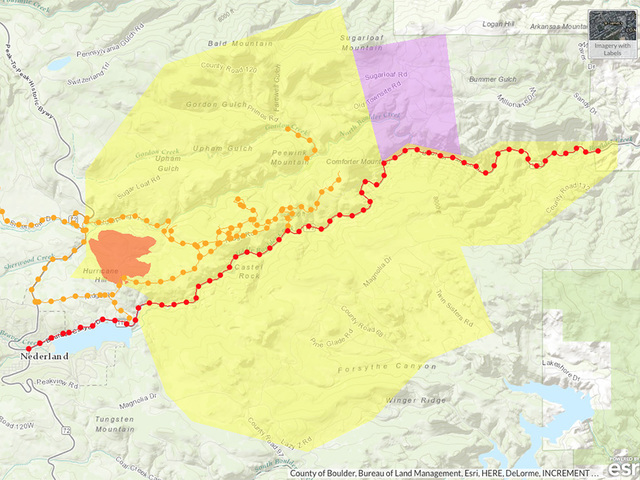 About 1,991 people are under mandatory evacuation orders. The evacuation area includes Boulder Canyon west of Magnolia and Sugarloaf Roads (south and southeast of the Barker Reservoir through Aspen Meadows), according to the Boulder Office of Emergency Management. That's in addition to both sides of Ridge Road and the east side of the Peak to Peak Highway. The affected subdivisions include Bonanza Mountain Estates, Cold Springs, Whispering Pines, St. Anton Highlands and Silver Springs. There is a shelter at Nederland High School and the East Boulder Recreation Center, 5560 Sioux Drive in Boulder. The Salvation Army was also providing meals for evacuees who stop in at the shelter. People who own horses, or other large animals, may take take them to Arapaho Ranch, 1250 Eldora Road. The Boulder County Fairgrounds, 9595 Nelson Road in Longmont, was also open to receive animals from nearby residents. Due to the fire, the Boulder Valley School District's final week of summer school classes in their two Nederland schools are canceled. ?All other summer schools in BVSD are operating as scheduled?, officials said. A fire relief fund has been set up through Foothills United Way. The money will go to residents impacted by the Cold Springs Fire. The Office of Emergency Management said the "funds will be distributed by the Boulder County Department of Housing and Human Services through case managers working with fire-impacted residents to determine need." Residents who need help may contact Boulder County Housing and Human Services at 303-441-1000. Officials said volunteers and in-kind donations are not needed at this time. To volunteer when help is needed, Help Colorado Now's website has a form to sign up for an e-newsletter with updates on volunteer needs. "Those seeking to volunteer should not show up at the evacuation centers and shelters or go to the scene of the disaster," the Office of Emergency Management said. "The arrival of unexpected volunteers will interfere with response efforts." A fire ban went in effect for all of Boulder County late Saturday afternoon and continues to be in effect. No fireworks and campfires are allowed under this ban, and smoking outdoors is also discouraged, an official with the Boulder County Sheriff's Office said. 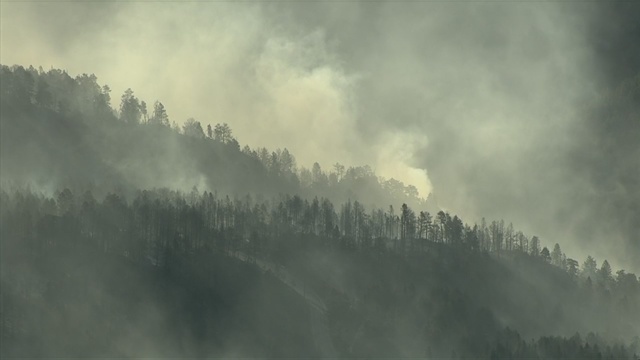 FEMA has approved the use of federal funds to help with firefighting costs for the Cold Springs Fire in Boulder County. This authorization makes FEMA funding available for 75 percent of the state's eligible firefighter's costs under an approved grant for managing, mitigating and controlling designated fires. The grants, however, do not provide monetary relief for individual home or business owners.